While the holiday season is a time of joy, it can also be a difficult time for many people. That’s why Niagara Health team members are living our Compassion in Action CORE value by finding ways to make the holiday season a little brighter for our patients, residents and community members. 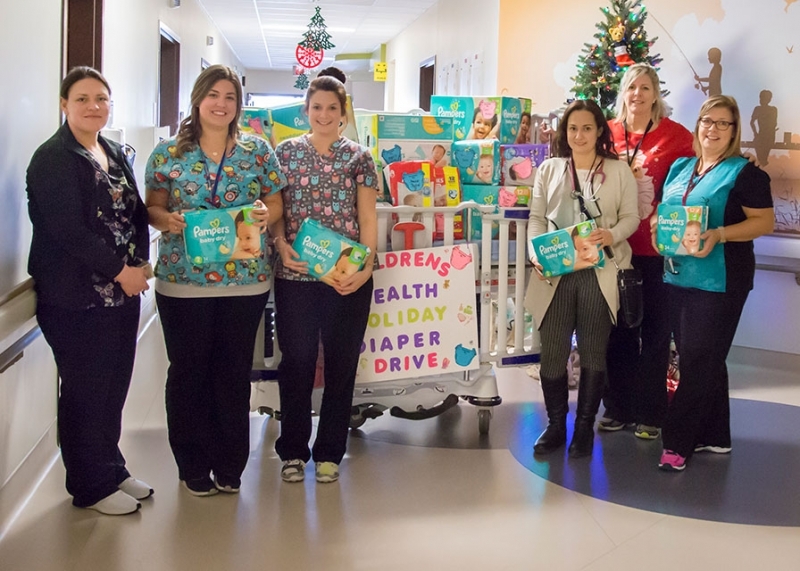 Our Children’s Health Unit and Special Care Nursery are holding a holiday diaper drive at our St. Catharines Site, as part of our 1,000 Acts of Kindness Workplace Challenge. 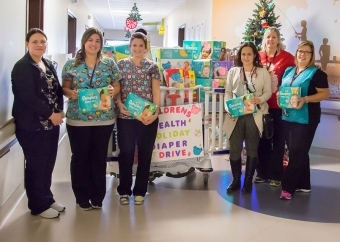 The teams are collecting donations of new diaper packages and boxes and donating them to local community agencies and families in need, with a goal of building a giant diaper tree by Christmas Day. Diaper donations are due by Friday, Dec. 22. Please call 905-378-4647, ext. 41309 for more information. Join our Niagara Health Foundation’s Celebration of Lights by donating in memory of someone special in your life. Celebration of Lights supports the purchase of patient equipment at all Niagara Health sites. Gifts totaling $50 will be printed in the St. Catharines Standard, Niagara Falls Review and Welland Tribune newspapers. Niagara Health team members are donating non-perishable food items and toys across our sites in support of Community Care, Open Arms Mission and Project Share. Every year, our Extended Care Unit/Interim Long-Term Care Unit residents make a wish for the holiday season. Their wish is placed on a tag attached to a candy cane on the Candy Cane Tree of Wishes in the lobby of the home. Thanks to the generosity of our staff, physicians, volunteers and visitors all of our residents will have gifts to open during the holidays. You can help enrich the lives of our residents by purchasing gift cards for crafts, celebrations and music. Please call extension 905-378-4647, ext. 33502 for more information. Niagara Health team members coordinate clothing drives every spring and fall to provide clothing to patients in need. With the winter weather upon us, Patient Advocate Services is looking for donations of new or gently used winter jackets, pants, hats and mittens. Please call 905 378-4647, ext. 49443 for more information. Our Recreation Therapy Department and patients of our Woolcott Wing at our Welland Site are organizing a Mitten Tree Drive. The mittens will be delivered to Women’s Place Welland. Do you enjoy wrapping gifts? Volunteer some time wrapping gifts with the St. Catharines Auxiliary. All proceeds support the purchase of medical equipment. Please contact Maureen moe.raham@gmail.com for more information.